George McLeay, company director and federal minister, was born on 6 August 1892 at Port Clinton, Yorke Peninsula, South Australia. He was one of six children, four sons and two daughters, of George McLeay, farmer, and Marguaretta, née Barton. Young George was educated first at Port Clinton and later in Adelaide at Unley Public School. He completed a commercial course at Muirden College and worked as a clerk before founding McLeay Brothers, originally accountants and agents, but later wholesale and retail merchants specialising in furniture and sporting goods. An active member of the St Andrew’s Literary and Debating Society’s Union Parliament, on one occasion he won the South Australian championship for debate, the future prime minister, James Scullin, presenting the prize. McLeay also established strong community and political connections as a member of the Australian Natives’ Association, St Andrew’s Masonic Lodge, and St Andrew’s Presbyterian Church. He joined the Liberal Union at age twenty and signalled his political ambitions by standing for the federal seat of Adelaide in 1922. Like his Victorian contemporary, Robert Menzies, McLeay’s first electoral campaign brought allegations that he had been a ‘cold-footer’ in the ‘Great War’. The secretary of the Liberal Union wrote to the Advertiser to attest that McLeay had actually volunteered in the first year of the war but had been rejected on medical grounds, the Advertiser publishing the letter as an advertisement on 15 December 1922—the day before the election. Nonetheless, McLeay was unsuccessful, as he was in the federal elections of 1925 and 1928. In 1934 he tried again, this time for the Senate when he stood as a candidate for the Liberal and Country League, and was elected. Within three months of taking his place as a United Australia Party senator in July 1935, he became a member of the Senate Standing Committee on Regulations and Ordinances. His first serious foray in debate raised issues concerning the Senate’s power to deal with regulations, the committee having been established only three years previously. On 22 October, though not at the instigation of the committee, he moved the disallowance of Statutory Rules, 1935, No. 30—the Dried Fruits Export Control (Licences) Regulations. Speaking for the Independent Dried Fruits Association of South Australia (a small group of disaffected growers), McLeay claimed that certain of these regulations were stifling legitimate competition with the Australian Dried Fruits Association whose members dominated the Dried Fruits Export Control Board. It was initially unclear whether McLeay could limit his motion to particular aspects of the regulations or if he had to take the statutory rule as a whole. It also remained unclear whether or not disallowing the whole automatically restored the regulations previously in operation. Moreover, Senator Hardy argued that McLeay was required to demonstrate that the regulations contravened the relevant legislation, a view tentatively supported by the President, Senator Lynch. Senator Brennan, an eminent barrister and assistant minister in the Lyons Government, argued initially that the Senate could not disallow or amend individual sections of regulations, then conceded that it may be possible. However, when, in November, McLeay attempted to amend his motion to disallow individual regulations, Brennan argued that the amended motion fell outside the statutory period (fifteen days) governing such motions. The President, after at first granting leave, ruled in Brennan’s favour and McLeay’s original motion was put and defeated. In 1936, during debate on the Acts Interpretation Bill, McLeay again opposed retrospective regulation. In August 1937 he replaced Duncan-Hughes as chairman of the committee, serving for a year. In 1937 McLeay became Government Whip, and by November of the following year was brought into the ministry, as Vice‑President of the Executive Council, by Joseph Lyons, though his fortunes would be closely tied to those of R. G. Menzies. In Menzies’ wartime ministries, McLeay was a member of the War Cabinet (September to November 1939) and the Economic Cabinet (from December 1939 until its dissolution in 1940); and in July 1941 was appointed to Cabinet’s Economic and Industrial Committee. He held various portfolios—Commerce, Trade and Customs, Postmaster-General, Repatriation, and Supply and Development. As Minister for Supply and Development and Chairman of the Shipping Control Board he was responsible for restoring fuel stocks, ‘the hardest job [he’d] ever taken on’. He remained Minister for Supply and Development and Vice-President of the Executive Council when Arthur Fadden replaced Menzies as Prime Minister in August 1941. In 1938 McLeay was Leader of the Government in the Senate, serving until 1941 when he led the Senate majority in Opposition through the rest of the war and the immediate postwar period until his defeat at the polls in 1946. In his earliest political speeches, McLeay emphasised themes that were to be constants over the next thirty years—the maintenance of the British Empire, assistance to primary producers, the support of British immigration. He was vehemently opposed to the ‘extreme elements’ within the Labor Party and the trade union movement. Campaigning in 1928, he had said: ‘The greatest tragedy in Australian national life to‑day was the loss of money and ill-feeling caused by strikes and industrial disputes’. In the Senate nearly a decade later, he expressed reservations about the 40‑hour week, noting that it would increase the costs of primary production, reduce workers’ incomes, and strain government capacity to service the national debt and meet pension and other social service commitments. A long-standing interest in Australia’s international role was evidenced by his support in 1938 of the establishment of a standing all-party foreign affairs committee. He deplored isolationism and a ‘head-in-the sand’ attitude to world affairs. What was crucial to national prosperity, as well as to national security, he contended, was the imperial connection: Australia, with Canada and the other dominions, ‘should be willing to share the responsibilities that attach to membership of the British Commonwealth of Nations’. The opportunity to put his wider internationalist views into practice came in 1945 when he was appointed as an ‘Assistant’ to the Australian delegation to the United Nations Conference on International Organization in San Francisco. It was another seven years before a foreign affairs committee was realised by the Menzies Government with the creation of the Joint Committee on Foreign Affairs. Defeated in 1946, McLeay was returned with the victorious Liberal-Country Party coalition in December 1949, taking his seat on 22 February 1950. He was re-elected in 1951 following the simultaneous dissolution. His pre-war ministerial responsibility for shipping made him a logical choice as Minister for Shipping and Fuel (1949–50), Minister for Fuel, Shipping and Transport (1950-51) and Minister for Shipping and Transport (1951–55). He oversaw the abolition of petrol rationing, the return to profitability of the Australian Shipping Board, and the modernisation of the Commonwealth’s Trans-Australian Railway, including the use of diesel locomotives. He combined these strategically important portfolios with the role of Deputy Leader of the Government in the Senate. With the waterfront a crucial arena of industrial conflict, McLeay now had direct involvement in the fight against ‘extremists’. He had never made any secret of his attitude to militant trade unions and his portfolios gave ample opportunities for robust criticism. In Parliament and in meetings across the country he denounced communist infiltration of the wharves and the pressure on workers to go slow. Thwarted in an attempt in 1950 to sell a ‘peace in industry’ plan, which encouraged workers to negotiate directly with employers, McLeay vested an equally vain hope in the Communist Party Dissolution Bill, predicting that communist control of the seamen’s, waterside workers’ and coalminers’ unions would be ‘attacked effectively’ by its passage. By April 1951 he was confessing publicly that the Government was in ‘a hopeless position’ over coal and steel: ‘We will never do any good in the key industries until we have the power to root out the Communist fanatics’. In October 1952, defending the Government’s Navigation Bill (designed to replace the Maritime Industry Commission with a single judge), he complained that he could not understand why Opposition senators who were ‘just as hostile as I am to the Communists are not prepared to get behind the Government in its attempt to deal with the Communist menace’. He had expressed the same bewilderment in April 1940 when Labor leaders seemed ambivalent towards communism. Among McLeay’s particular contributions to the Liberal–Country Party governments from 1949 was his rapport with his friend, and Country Party deputy leader, John McEwen. With Philip McBride, McLeay was recognised by McEwen as being ‘closely aligned with the Country Party’. He regularly acted as Minister for Commerce and Agriculture when McEwen was overseas. In the argument over the exchange rate early in the life of the ministry, McLeay and McBride sided with the Country Party in opposing the Prime Minister’s wish to revalue the pound. 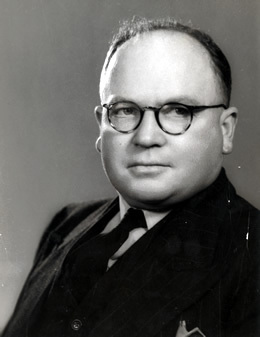 Generally, however, McLeay could be counted on to be in Menzies’ camp; from 1939 onwards he had been one of Menzies’ most loyal party room supporters. Absent from the meeting that led to his leader’s resignation in 1941, he made amends by backing Menzies through the manoeuvrings that accompanied the disintegration of the United Australia Party. In March 1943, he joined Menzies in challenging the leadership of W. M. Hughes. He was one of seventeen federal parliamentarians (including ten South Australians) who formed the National Service Group that stood apart from the UAP thereafter, and a member of the group’s five-man executive. He later played a role in the formation of the Liberal Party. McLeay attained considerable prominence in 1942 and 1943 over the recurrent issue of the limits placed on the overseas service of members of the Citizen Military Forces. Pressing for the lifting of all restrictions on the areas in which militia troops could serve, he was at odds both with the Labor Government and with the majority of the joint Opposition executive. As an avowed conscriptionist he introduced the bill to amend the National Security Act by removing the section that prohibited compulsory military service beyond the limits of Australia and its territories. The legislation was passed in the Senate but rejected in the House of Representatives. Meanwhile the Curtin Government’s own Defence (Citizen Military Forces) Bill, which provided for militia service in the South-West Pacific Zone (New Guinea, Timor, and parts of Indonesia and the Solomon Islands), was passed without amendment. Unlike Percy Spender, MHR, and Robert Menzies, who separated themselves from the Opposition executive over the overseas service issue, McLeay seems not to have incurred the wrath of UAP and Country Party colleagues who feared the possibility of an election if the Government could not carry its policy. McLeay’s death in office on 14 September 1955 was a shock to family and friends. He was survived by his wife of thirty-two years, Marcia Doreen (Dorothy), née Weston, whom he had married on 21 October 1924 at St Andrew’s Presbyterian Church, Unley, and a son, David, and daughter Helen. He was accorded a state funeral and buried at Centennial Park, Springbank. The warm tributes paid to him by Senate colleagues were manifestly genuine. There was ‘not a shred of meanness or bitterness’ in him said the Leader of the Government in the Senate, Neil O’Sullivan, while Senate Opposition Leader, N. E. McKenna, recalled that he fought ‘hard but fairly’ and was notable for his ‘manliness and his good humour’. Menzies, perhaps recalling an occasion when he had humiliatingly chastised his friend for coming unprepared to Cabinet, also dwelt on McLeay’s ‘infinite good nature’. In fact, McLeay had been a capable and indefatigable minister, more interested in service than personal advancement. Advertiser (Adel. ), 15 Sept. 1955, p. 2; News (Adel. ), 14 Sept. 1955, p. 1; Herald (Melb. ), 6 Aug. 1941, p. 6; Advertiser (Adel. ), 15 Dec. 1922, p. 17, 15 Nov. 1928, p. 22, 17 Sept. 1934, p. 18. CPD, 22 Oct. 1935, pp. 883, 887-94, 24 Oct. 1935, p. 1037, 30 Oct. 1935, pp. 1095–6, 31 Oct. 1935, p. 1174, 14 Nov. 1935, pp. 1589-616; Geoffrey Sawer, Australian Federal Politics and Law 1929–1949, MUP, Carlton, Vic., 1963, p. 91; CPD, 17 Sept. 1936, pp. 204-6, 25 Aug. 1937, pp. 74-6. Paul Hasluck, The Government and the People 1939-1941, AWM, Canberra, 1952, pp. 117, 421, 425, 571-6; CPD, 14 Sept. 1955, p. 111; S. J. Butlin, War Economy 1939-1942, AWM, Canberra, 1955, pp. 150, 435, 450-1; Herald (Melb. ), 6 Aug. 1941, p. 6; CPD, 10 Nov. 1938, p. 1484, 17 Sept. 1941, p. 279, 8 Oct. 1941, p. 723, 4 June 1947, p. 3294. CPD, 29 Apr. 1936, pp. 941–4, 14 Sept. 1944, p. 768; Advertiser (Adel. ), 15 Nov. 1928, p. 22, CPD, 17 June 1937, pp. 13–16. Age (Melb. ), 14 Nov. 1938, p. 10; SMH, 14 Nov. 1938, p. 11; CPD, 17 Nov. 1938, p. 1579, 17 June 1947, pp. 15–16; CPP, Report by the Australian delegates to the United Nations Conference on International Organization, San Francisco, 1945; W. J. Hudson, Australia and the New World Order: Evatt at San Francisco, 1945, Research School of Pacific Studies, ANU, Canberra, 1993, p. 39. CPD, 14 Sept. 1944, pp. 768–9, 27 June 1946, pp. 1859–66, 19 Oct. 1950, pp. 1058–60; Advertiser (Adel. ), 28 Feb. 1950, p. 1, 18 Oct. 1950, p. 3, 14 Apr. 1951, p. 3; CPD, 14 Oct. 1952, pp. 2953–6, 15 Oct. 1952, pp. 3115–16, 18 Apr. 1940, p. 75. John McEwen, John McEwen: His Story, privately published, 1983, pp. 34, 42; A. W. Martin, Robert Menzies: A Life, vol. 1, MUP, Carlton, Vic., 1993, pp. 381-2, 407; Paul Hasluck, The Government and the People 1942-1945, AWM, Canberra, 1970, pp. 356-8; Percy Spender, Politics and a Man, Collins, Sydney, 1972, pp. 200-1; Cameron Hazlehurst, Menzies Observed, George Allen & Unwin, Sydney, 1979, pp. 260–5; Ian Hancock, National and Permanent? The Federal Organisation of the Liberal Party of Australia, 1944-1965, MUP, Carlton South, Vic., 2000, pp. 55, 275; Advertiser (Adel. ), 15 Sept. 1955, p. 2. CPD, 25 Feb. 1942, pp. 18-19, 12 Feb. 1943, pp. 623-9, 24 Feb. 1943, p. 922, 17 Feb. 1943, pp. 761-5, 18 Feb. 1943, pp. 875-80; Hasluck, The Government and the People 1942-1945, pp. 344-7; Spender, Politics and a Man, pp. 190–8. News (Adel. ), 13 Sept. 1955, p. 1, 14 Sept. 1955, pp. 1–2, 22, 16 Sept. 1955, p. 2; SMH, 15 Sept. 1955, p. 8; Advertiser (Adel. ), 15 Sept. 1955, pp. 1, 2; CPD, 14 Sept. 1955, pp. 111–12, 14 Sept. 1955 (R), pp. 629–31; Kevin Perkins, Menzies: Last of the Queen’s Men, Rigby, Adelaide, 1968, pp. 186–7; Eric Richards, ‘McLeay, George’, ADB, vol. 15. This biography was first published in The Biographical Dictionary of the Australian Senate, vol. 2, 1929-1962, Melbourne University Press, Carlton, Vic., 2004, pp. 281-285.